I admit, when I first got into sports investing and looked into the football (soccer) betting markets, the 1X2 betting was at first confusing. Not to my surprise, I was not alone, but after getting very familiar with 1X2, I wanted to simplify it for our North American sports investor members who are magnets for North American sports, and neglect the investment potential out of the European football betting markets. 1X2 betting is also known as three-way betting, and simply refers to betting on a home win, a draw or an away win. The 2 marks the away win. Simple right? Hold on. 1X2 betting lines attempts to mirror the true odds for every possible outcome, less the bookmaker’s hold. So it does not aim to even out any indifferences between the teams playing, or other influencing factors against the odds. Visit your preferred online sports book, and you find the English Premier League match ups. You find Aston Villa versus Newcastle. When looking at the 1X2 odds, the home win (1) is priced at 2.55 (ex. $100 wager: For the win is $100 X 2.55 = $255, which is $155 profit). The draw is priced at 3.30 and the away win is 2.85. If you choose to bet on Aston Villa you have made a 1 bet. If you bet the draw you went for X, and if you went for Newcastle you bet on 2. 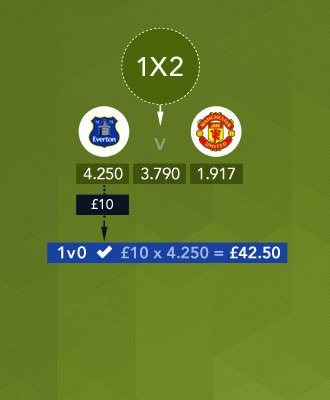 Bookmakers use 1X2 betting for every betting market where three outcomes are possible. It is also used in European handicap betting lines where a draw is still possible. A European handicap would typically be when one team is given a one goal head start (or fractional goal head start as in asian handicapping), but the option of a draw is still possible and an option the punter can wager on. Why 1X2 betting is still used is more or less based on old ways unchanged, mostly in the European betting markets. But also it allows online sports books and bookmakers to squeeze out additional profits of the punter. Even so, there are other football betting strategies the punter can take advantage beyond 1X2 odds, such as the three other advanced soccer betting tips or the popular soccer betting system; Fibonacci strategy. If you look at the betting odds available in the market and compare these you will find that for instance the biggest football leagues in Europe are trading at 93-94% on average, while lines such as Asian handicap, where one seek to even out the encounter as much as possible through the handicap are trading at a much lower vig. Interested to take a football tip and wager on a match up with 1X2 odds? Try our soccer investment services to see which soccer tips and predictions are being selected from the global soccer consensus, our pool of expert football tipsters and our proprietary intelligent betting tips produced data-driven analysis from the collective intelligence of the global consensus, and expert tips and analysis.